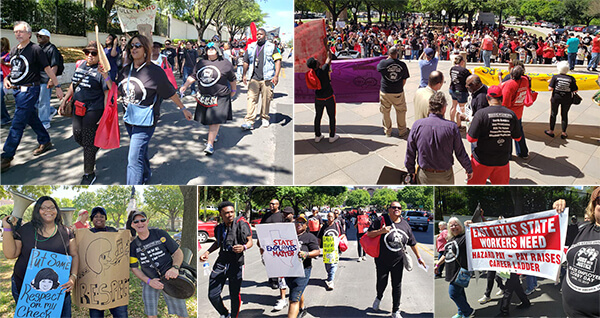 Hundreds of Texas state workers, members of the Texas State Employees Union-CWA Local 6186, gathered in Austin on Wednesday for a huge lobby day to take a stand for economic and social justice for state workers and all Texans. TSEU-CWA members from across the state were there to tell state legislators that they are ready to fight to restore funding for public services, to protect state employee benefits, and to win a real across-the-board raise. Currently, a pay raise for state employees and retirees is not included in draft budgets created by legislators. The last time state workers saw an across-the-board raise, in the 2015 legislative session, lawmakers approved a 2.5% raise that was completely wiped out by a 2.6% increase in state employees' contributions to the ERS pension fund. On top of that, employees saw big cost increases in dependent health care coverage, meaning state employees actually saw their take home pay decrease. With turnover rates at state agencies higher than they've been since 1990, TSEU-CWA members are calling for legislators to give all state agency and university workers a long-overdue $6,000 raise. Read more about the lobby day here. Hundreds of Texas state workers, members of the Texas State Employees Union-CWA Local 6186, gathered in Austin for a huge lobby day to take a stand for economic and social justice for state workers and all Texans.